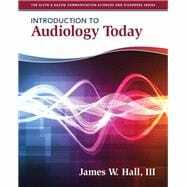 An up-to-date introduction to the profession of audiology, Introduction to Audiology Today is written to stimulate the student’s interest and excitement in audiology or speech-language pathology as a career choice. Chapters on hearing science covering essential information about sound and auditory anatomy/physiology include helpful figures and readable explanations of recent research findings. Current behavioral and objective procedures and strategies for hearing assessment of children and adults are described and consistently related to clinical audiology practice. Two chapters are devoted to a readable and up-to-date review of the diverse etiologies underlying peripheral and central auditory dysfunction, including auditory neuropathy spectrum disorder and auditory processing disorders. The text is enhanced with an assortment of high quality digital photographs illustrating the tools and technologies used by audiologists in clinical practice. James W. Hall III received a Bachelor’s degree in Biology from American International College, a Masters degree in Speech Pathology from Northwestern University and, in 1979, his PhD in Audiology from Baylor College of Medicine under the direction of Dr. James Jerger. Since then, he has held clinical, administrative, and academic audiology positions at major medical centers including the University of Pennsylvania, the University of Texas Medical School-Houston, Vanderbilt University and the University of Florida. Throughout his career, Dr. Hall has maintained a clinical practice and conducted funded research. He’s also served as a clinical instructor and mentor in Doctor of Audiology and PhD programs. He now holds an appointment as Extraordinary Professor in the Department of Communication Pathology at the University of Pretoria in South Africa and adjunct faculty positions at multiple universities in the USA. Dr. Hall is a Founding Member of the American Academy of Audiology and serves on many professional committees, task forces, and editorial boards. He regularly gives workshops, seminars, and lectures throughout the United States and internationally on diverse audiology and hearing-related topics. Dr. Hall is the author of over 150 professional publications, including popular textbooks such as the New Handbook of Auditory Evoked Responses, Audiologists’ Desk Reference (Volumes I and II), Objective Assessment of Hearing, and Otoacoustic Emissions: Principles, Procedures, and Protocols. Additional background information about Dr. Hall is available on his website: www.audiologyworld.net.